The king of Spain has issued a renewed call for unity amid the ongoing fallout from Catalonia's outlawed independence referendum. 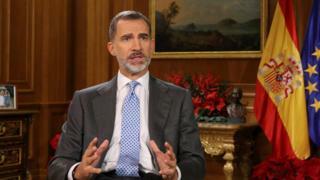 In his Christmas message, Felipe VI urged the people of Catalonia to choose coexistence rather than confrontation. He did not directly mention the leaders of the Catalan separatist movement. In the wake of October's referendum in the region, the king heavily criticised those spearheading Catalonia's independence movement. Some Catalans were angered by this, and the fact that he made no mention of the heavy-handed Spanish police operation to block the vote. BBC Europe correspondent Kevin Connolly says the king's core underlying message about the importance of national unity remains unchanged, but his Christmas broadcast was more cautious and conciliatory. The king said the politicians elected to the Catalan parliament this week - which included a narrow separatist majority - had to "face the problems that affect all Catalans, with respect to plurality and bearing in mind their responsibility to the common good". "The road cannot lead again to confrontation and exclusion, which as we already know generate nothing but discord, uncertainty and discouragement," he said from his Madrid residence. He praised what he called Catalonia's openness and creative spirit. The leader of the bloc of separatist parties which won a majority in Thursday's election, Carles Puigdemont, remains in Brussels - a fugitive from the Spanish judicial authorities who have arrested and tried several key separatist leaders in the wake of the illegal referendum. Mr Puigdemont has called on Spanish Prime Minister Mariano Rajoy to meet him. Our correspondent says Mr Rajoy clearly has no intention of responding to this.